It is with great pleasure that the editors present the First Edition of Everything You Need to Know: Out of the Operating Room and Minimally Invasive Cardiothoracic Procedures. Being the first of its kind, this book is geared to meet and adapt to the rapidly expanding changes in the field of cardiothoracic surgery and anesthesia. In the past decade, there has been a paradigm shift in the practice and staffing of cardiothoracic surgery from conventional, surgeon-driven, open- and operating room-based approaches to less invasive, technology-driven procedures that take place outside the conventional operating room setting; these include angiography and electrophysiology suites as well as designed hybrid operating rooms that are staffed by an interdisciplinary cardiac team. With this change, the role of the anesthesiologists has evolved beyond the simple provision of anesthetics to a more proactive role where the anesthesiologist provides guidance to other members of the cardiac team as well as reacting to potentially catastrophic complications that may occur during these procedures. It is therefore imperative that the anesthesiologist be aware of the challenges imposed by these procedures regarding managing more critically ill patients, adapting to the limitations of space, radiation exposure, knowledge on advanced imaging modalities and familiarity with procedure technicalities. This book provides an invaluable up-to-date and inclusive guide for anesthesiologists who are involved in these procedures. This book is crafted in an easy-to-read manner. It begins with a medical prospective and flows succinctly through procedures performed at the angiography and electrophysiology suites, hybrid and conventional operating rooms, and ending with intensive postoperative care. Relatively novel procedures such as the WATCHMAN procedure, adult congenital septal defect closures, valve-in-valve, and robotic-assisted and thoracic endovascular aneurysm repair (TEVAR) are extensively covered. Each chapter provides numerous high-quality illustrations as well as tables that help clarify its message and is written by a nationally recognized expert in the field. 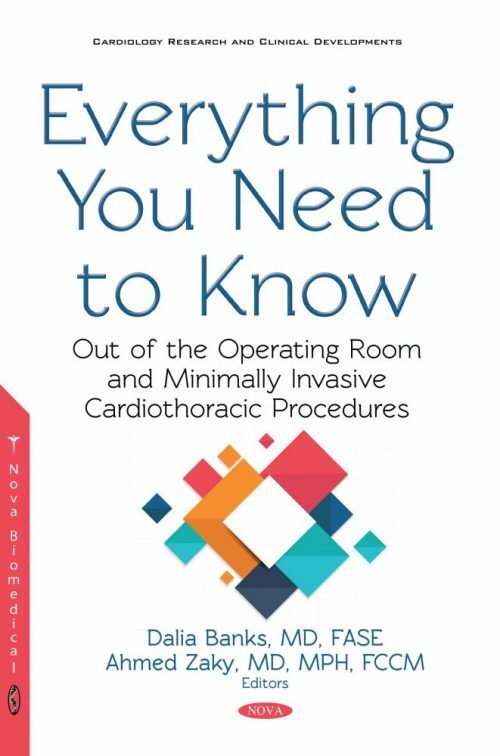 Everything You Need to Know: Out of the Operating Room and Minimally Invasive Cardiothoracic Procedures targets general as well as cardiothoracic anesthesiology residents, fellows, practitioners, and certified nurse anesthetists who share the care of patients undergoing these procedures. This book may also be useful to cardiology and electrophysiology trainees and practitioners who perform these procedures on a daily basis and who will find it a valuable guide to understanding anesthesiology.